I don’t even want to do the math of how many Amaretti cookies I’ve eaten these past few days. ??? At least this is a pretty easy recipe that I didn’t have to test and re-test a bazillion times, because it comes from a cookbook. I was gifted two copies (Scroll down for a chance to win one!) by Blogging for Books and immediately knew I had to share a recipe from such an amazing cookbook with you, my dearest readers and friends. And let me tell you, it was hard to pick just one! The book is full of lovely photos and delicious recipes from rich sauces to meaty ragus and perfectly charred vegetables. The author took inspiration by the humble traditions of cucina povera, the frugal cooking of Italian peasants, to bring us a forgotten simplicity to home cooking, in recipes that are approachable and can be made in any kitchen. 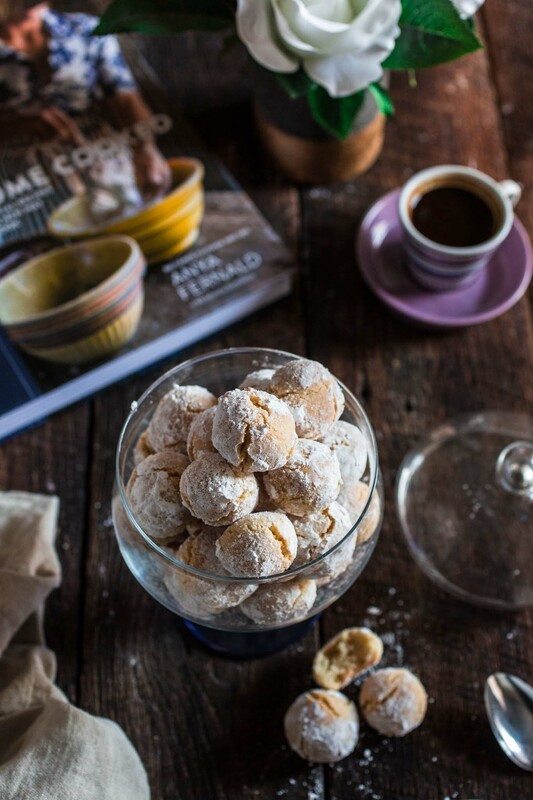 As I was leafing through the book, I came across this recipe for Amaretti Cookies and, since I couldn’t remember the last time I had them, I decided it was about time I added this sweet treat to this blog’s library. And as soon as my whole apartment started smelling of almonds, I knew I made the right decision! But these are pretty similar to the amaretti I’ve had in Italian bakeries and restaurants in Brazil and here in NYC, so if you ask me, I think they are pretty darn Italiani! The only modification I did to the original recipe was to roll the cookies in powdered sugar before baking them, so they would look more fun and festive. Other than that, the recipe worked like a charm in the first attempt, since the recipe is simple and very easy to follow. 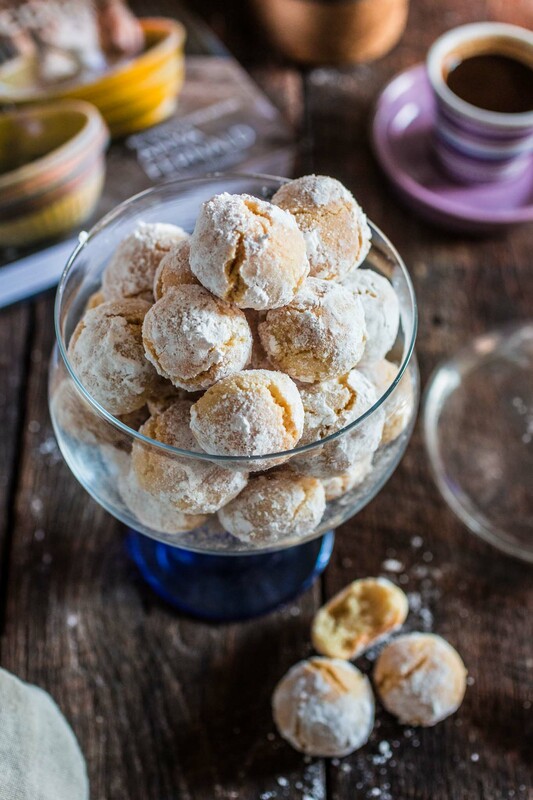 When the amaretti cookies are fresh out of the oven, they’re are soft and airy, with a slight bite to them. As they sit and dry, they become crunchier and chewier, like the store-bought ones. However, you shouldn’t expect them to melt in your mouth like their French cousins, the macarons. Though Amaretti cookies are the precursors to the soft textured macarons, the Amaretti have a slight crust on the outside and a dense, chewy center. I like to see them like a happy medium between macarons and biscotti. Amaretti cookies originated in Venice during the late Renaissance period and they get their names from the Italian word “amaro”, which means “bitter”, because of the slight bitter flavor of the almonds. 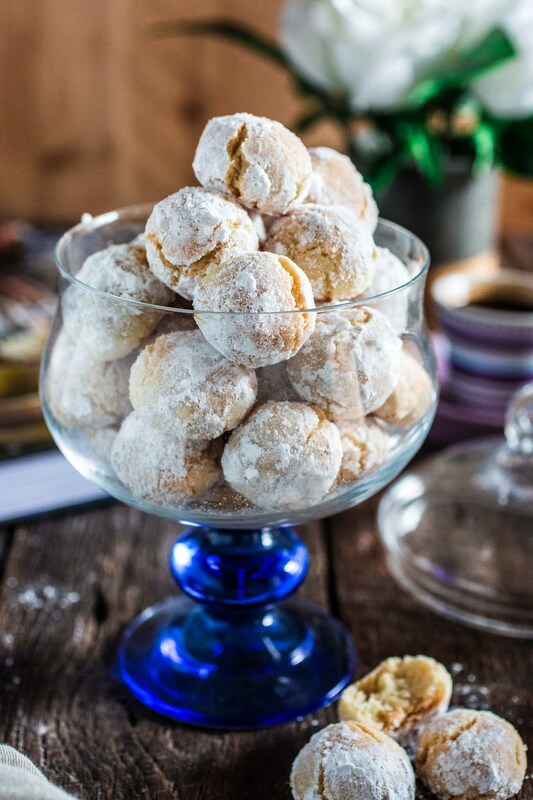 So the literal translation of “amaretti” wold be “the little bitter ones”. Anya’s recipe calls for almond extract, but I am intrigued to try to make them with Amaretto liqueur instead. Uh oh, I sense a third batch of amaretti cookies in my near future! But this time around I’ll try my best not to eat them all, so I can have leftovers to transform into other marvelous desserts, like trifles, tiramisù, pie crust, and even ice cream. 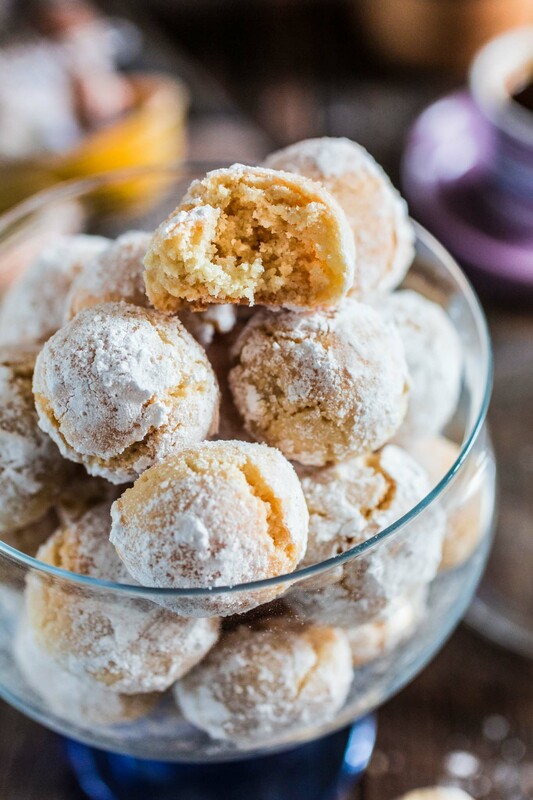 Or maybe I’ll just invite my neighbors over for a glass of wine and we can dunk the amaretti cookies in the wine, like the Italians do. Prepare one large baking sheet by covering it with parchment paper. Sift the flours and sugar into a large bowl. 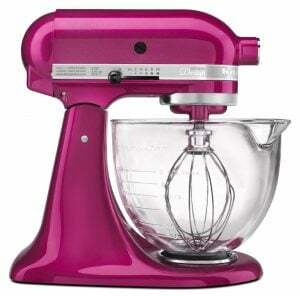 Using a stand or hand mixer, whisk the egg whites with the salt until soft peaks form. Whisk in the almond extract (or liqueur) just until combined. Transfer the whites into the dry ingredients and mix with your hands until a sticky dough forms. 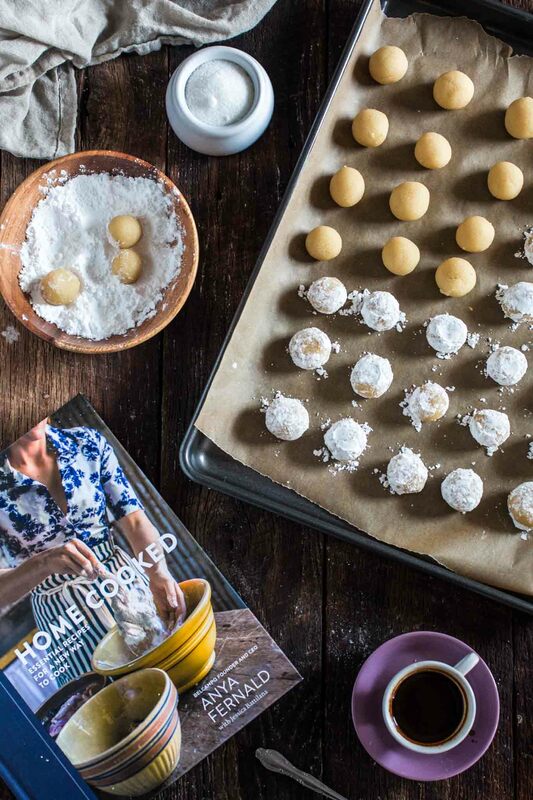 Roll the dough into 1-inch balls, roll into the powdered sugar and place on the prepared baking sheets, 1 inch apart. Flatten the cookies slightly, then let them stand at room temperature for 15 minutes, while your oven is preheating. Bake the amaretti cookies until the tops are cracked and the cookies are golden brown, about 20 minutes. Remove from oven and let them cool on the baking sheet for a couple of minutes, then transfer to a wire rack so they can cool completely. The cookies will keep for up to 3 days in an airtight container. I am giving away a copy of the “Home Cooked” cookbook, courtesy of Blogging for Books, to one lucky U.S. reader. 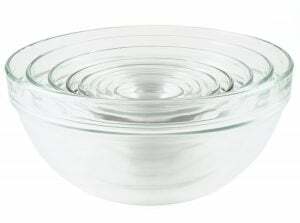 For a chance to win, simply comment on this post telling me what is your favorite Italian dish. The winner will be selected at random and notified by email no later than August 21st. You can use the rafflecopter below for bonus entries! One Italian dish is torture! Lasagne, gnocci, pasta, piccata, antipasto, risotto, aranchini… but if I absolutely had to choose just one I think I’ll go with pizza. I know! It’s hard to choose isn’t it? I love Italian cuisine! I am not sure how Italian this is, it may have originated in the US by an Italian…… But my favorite Italian dish is an Italian beef sandwich. I reread my original comment and I worded it funny! I meant that I’m not sure if the sandwich originated in Italy! The cookies sound amazing and I will definitely be trying them!! My favorite Italian dish is gnocchi. I’d love some right now. I’m a fettuccini Alfredo girl all the way! Not enough leftover to shoot, now that’s funny. I have done that before. Oops! These look so delicate and perfect. You rolling in the powdered sugar is brilliant! I don’t drink so the extract would be my go to here. Every time I’ve had amaretti cookies they have been rock hard, these look tender and addictive. I mean, look at how small and cute they are? Hard question ;) My favorite Italian dish is Ravioli. My favorite is mom’s home made Lasagne! I love this type of cookie! Yours look amazing! Favorite Italian Dish gotta choose meatballs. Hi Barbora. I’m so honored that my blog is the first recipient of your comment love! :) As for the cookies, I press them very slightly (as I like them a little rounder) before I let them air dry for 15 minutes. So press and then wait 15, if that makes sense! :) Although I think it wouldn’t make much of a difference. I hope that helps! And thanks for stopping by to leave me feedback! Just baked them, thanks for the recipe!!! These were so easy to make AND delicious! Made them for a church event and were a huge hit! Can’t wait to make them again. I’m new to this computer stuff, but I love your sight and your insights (sarcasm). Keep it up for all of us old schoolers, it made me feel more comfortable. Thanks!!! Made these tonight and they were DELICIOUS!!! Only change…baked them 5 minutes longer and increased the almond extract to 1 tsp. can this dough be made ahead of time and frozen for baking at a later date? I made the amaretti cookies and didn’t have good luck. I thought it needed some sort of moisture added and I didn’t know what to do with the 2 Tablespoon of flour. My cookie would not hold together. I am about to put a batch of these in the oven for the second time this week – I love them! I was jonesing for an amaretti just like they make at my favorite Italian bakery where I grew up in Baltimore, so I decided to try my hand at baking some. These don’t quite look the same as theirs, but they taste almost exactly the same. Thank you for this recipe! Hi! Is there really no butter/oil/shortening in this cookie?